Highly specialized cartilage is characteristically avascular and non-neural in composition with low cell numbers in an aliphatic environment. Despite its apparent simplicity, bioengineering regenerative hyaline cartilage in a form effective for implantation remains challenging in musculoskeletal tissue engineering. Existing surgical techniques including autologous chondrocyte implantation (ACI) and matrix-induced autologous chondrocyte implantation (MACI) are considered superior to self-repair induction techniques. However, both MACI and ACI are complex, multistage procedures that require a double operation; first for surgical excision of native cartilage, followed by expansion of adult chondrocytes in vitro prior to implantation by a second operation. Regenerating robust articular hyaline-like cartilage is a key priority in musculoskeletal tissue engineering to prevent cost-intensive degenerative osteoarthritis that limits the quality of life in global healthcare. 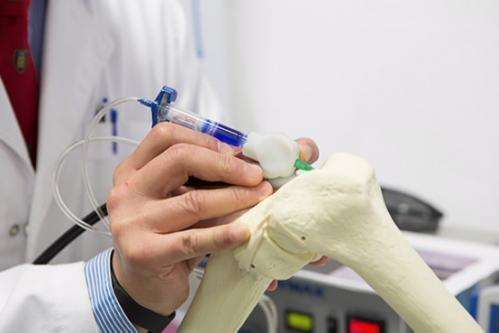 Integrating mesenchymal stem cells and 3-D printing technologies has shown significant promise in bone tissue engineering– although the key challenge remains in transferring the bench-based technology to the operating room for real-time applications. To tackle this, a team of Australian orthopedic surgeons and bioengineers collaboratively proposed an in situ additive manufacturing technique for effective cartilage regeneration. The handheld engineered extrusion device known as the BioPen offers an advanced, co-axial extrusion strategy to deposit cells embedded in a hydrogel material within a surgical setting. The dynamics of material distribution to facilitate cell survival, and the maintenance of mechanical properties for cartilage tissue engineering of BioPen are now published in Biofabrication, IOP Science. 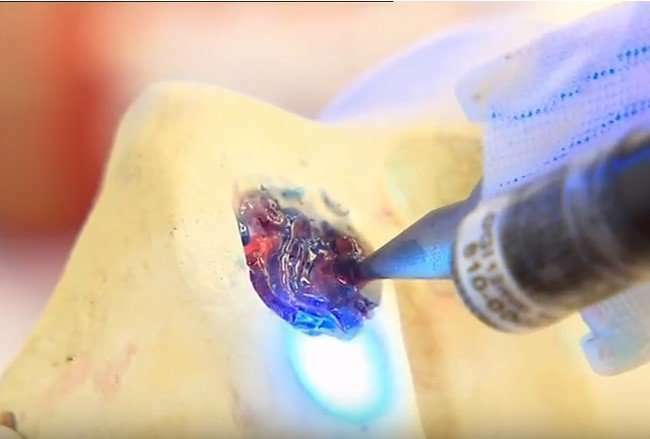 In the recent study, Claudia Di Bella and co-workers conducted neocartilage biofabrication as a requisite step in the path toward clinical translation of the BioPen device, preceded by an in vivo proof-of-principle pilot animal study performed in a sheep model. The authors used human adipose-derived mesenchymal stem cells (hADSCs) laden in gelatin methacrylate (GelMa) and hyaluronic acid methacrylate (HAMa) hydrogels, extruded via the BioPen to generate bioscaffolds that formed hyaline-like cartilage. The authors replicated the previously established protocol to synthesize the GelMa/HAMa hydrogel. The surgical device showed capacity to biofabricate a regenerative stem cell niche in situ with future potential to change the existing clinical approaches in surgical practice for organ and tissue regeneration. Human stem cells were harvested from the infrapatellar fat pad (IPFP) of patients undergoing total knee replacement. To control the size and shape of the scaffolds extruded by the BioPen, the authors used polydimethylsiloxane (PDMS) cylindrical molds to create a desired shape with regulated cell numbers, providing reproducible structural organization with 3-D geometry for mechanical testing. Immediately after extrusion, samples were irradiated with UV light for photopolymerization. Materials were characterized with mechanical loading tests for compression and atomic force microscopy (AFM) to determine surface topology. The capacity to produce hyaline-like neocartilage was analyzed using the cellular response to the chondrogenic stimuli via histology, gene and protein expression analysis. The building of new tissue was defined by protein localization and organization of the main components of hyaline cartilage. The neocartilage function was determined via mechanical properties with time. The study demonstrated the capacity of the BioPen to produce human hyaline-like cartilage by coaxial extrusion of hADSC-laden in GelMa/HAMa hydrogel. A handheld device for surgical extrusion can also overcome clinical graft-site mismatch limitations. The previously established core/shell distribution of the scaffold geometry protected the survival and proliferative potential of the hADSCs. Genes expressed during hyaline-like cartilage formation were quantified with qRT-PCR, the expression of SOX9 – the master regulator of chondrogenesis reflected the chondrogenic potential of the stem cells source. Cells similarly expressed COL2A1 (type II collagen found in cartilage) and ACAN (that forms proteoglycan protein) to demonstrate differentiation. Bioscaffolds were further tested using non-linear two-photon microscopy and second-harmonic generation (SHG) to detect mature fibrillary collagen after eight weeks of chondrogenesis. The possibility of delivering osteogenic and chondrogenic growth factors within the hydrogel will be considered in the future. Additional studies will also aim to achieve biomechanical properties for the chondrogenic bioscaffolds comparable to native articular cartilage. Studies hereon will evaluate de novo cartilage formation to understand the interplay between stem cells and 3-D architectured hydrogels with different mechanical and biodegradation properties.